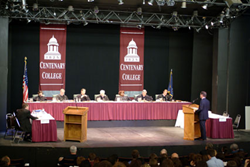 Centenary College will be the host site for a televised U.S. Senate Debate at Marjorie Lyons Playhouse on Tuesday, October 14. Hosting the debate between our candidates for the Senate is a great opportunity for Centenary. Centenary College will be the host site for a televised U.S. Senate Debate at Marjorie Lyons Playhouse on Tuesday, October 14, at 7 p.m. U.S. Senator Mary Landrieu, 6th District Congressman Bill Cassidy, and Rob Maness have all accepted invitations to take part in the debate. Other sponsors of the event include Louisiana Public Broadcasting (LPB), the Council for A Better Louisiana (CABL), the AARP, and the Shreveport Chamber of Commerce. "Hosting the debate between our candidates for the Senate is a great opportunity for Centenary," said Dr. Christopher Parker, Assistant Professor of Political Science. "These debates allow for the opposing views of the candidates to be articulated so that voters can get a better sense of the issues that face this state and a country as a whole. It provides an opportunity to better get to know the candidates and for a true exchange of ideas that we can’t get from television ads or other forms of campaign advertisements. These types of events play an important role in informing voters as they prepare to head to the voting booth in November." Candidates were invited based on criteria established by CABL that require participating contenders to have polled at least five percent in a recognized nonpartisan or news media poll released prior to the debate or raised and spent at least $250,000 in campaign contributions, established a campaign committee with a treasurer and campaign staff, and filed campaign finance reports with the Federal Election Commission prior to the debate. All three of the invited candidates have met these criteria. The debate will air live on Tuesday, October 14, from 7-8 p.m. on LPB stations around the state. Attendance at the debate is by invitation only.